Trails are meant to be run down, just like personal records. The enhanced LEADVILLE v3 Trail Running Shoe from New Balance has the endurance to keep going, just like you. With its durable Vibram outsole, reinforced Toe Protect, and mesh uppers that provide comfortable support all day, even when the ride gets bumpy your feet won't be holding you back. 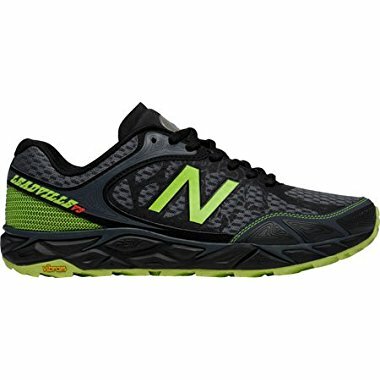 "The New Balance Leadville v3 running shoe delivers exceptional lightweight traction with its Vibram outsole, and supports superior foot health with an antimicrobial treatment." Trails are meant to be run down, just like personal records. The enhanced LEADVILLE v3 Trail Running Shoe from New Balance has the endurance to keep going, just like you. With its durable Vibram outsole, reinforced Toe Protect, and mesh uppers that provide comfortable support all day, even when the ride gets bumpy your feet won't be holding you back. Antimicrobial Treatment to Resist Odor No-Sew Material Application Gusseted Tongue with 3/4 Sure Lace Toe Protect 8 mm Drop. Product Improvements: Name changed from 1210 to Leadville v3 in honor of the 100 mile endurance race that inspired the shoe. Removed the Rock Stop plate from v2's forefoot to improve flexbility. Size: 8 D. Color: Black/Toxic Green. Gender: Male. Age Group: Adult.